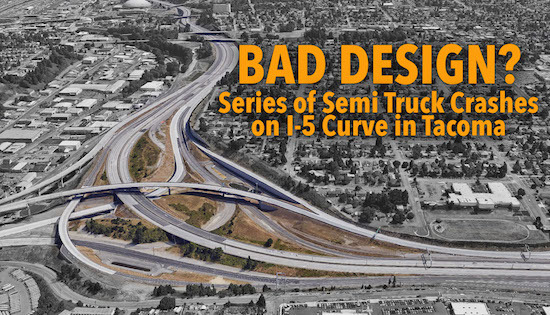 If you spend any time driving in or around Tacoma, you are likely familiar with a quarter-mile stretch of Interstate 5 that is notorious for crashes. The location — near the I-5 and State Route 16 interchange — has seen plenty of devastating crashes involving semi trucks in the past year. In fact, there have been eight high-profile semi truck collisions since September 2018. Continue reading for details on the crashes, the configuration of the highway and what solutions are being proposed. March 26, 2019. In the early morning hours, a semi truck driver heading south lost control on the wet roadway and slammed into a barrier. The driver was cited for negligent driving in the second degree. No injuries were reported. January 23, 2019. Just after 3:30 a.m., a semi truck struck the barrier on southbound I-5, blocking all lanes of traffic in both directions. The truck spilled 120 gallons of fuel onto the roadway. Minor injuries were reported. January 17, 2019. Around 1:50 a.m., a semi truck heading south lost control on the wet road and landed on top of the center concrete barrier. A section of the barrier was pushed into the northbound lanes. No injuries were reported. December 11, 2018. A semi attempting to pass traffic was traveling too fast on the wet roadway approaching the curve when it lost control. The trailer swung around and collided with another vehicle. No injuries were reported. November 21, 2018. A semi truck jackknifed going southbound, hitting the center barrier and pushing part of the barrier into the northbound lanes. No injuries were reported. October 1, 2018. Around 11:30 p.m., a semi truck traveling south jackknifed, struck the center barrier and caused another semi driver to hit the barrier. The semi in the northbound lanes hit at least five other vehicles. The semi driver who caused the accident left the scene, but was tracked down at a nearby exit and cooperated with investigators. Six people were taken to local hospitals, one with serious injuries. September 12, 2018. A southbound semi truck hit the center barrier and shoved it into the northbound lanes. Photos from the scene show a slick roadway. No injuries were immediately reported. The current configuration of I-5 has been in place since May 2018. Road work in the area is part of the Interstate 5-SR 16 project that will introduce direct-access ramps to connect HOV lanes. Part of that work includes the realignment of I-5 in both directions. Construction is expected to be complete by May, then the same thing will happen on the Puyallup River bridge overpass. The current alignment of I-5 seems to be making things more problematic. The highway is separated by temporary concrete jersey barriers. When a large truck collides with that barrier, it is pushed into the oncoming lanes. The construction zone features lanes that are only 11-feet wide instead of the normal 12-feet lanes. That meets state and federal guidelines, but leaves very little shoulder space (sometimes 4 feet or less) and barely any room for large trucks to maneuver. Washington State Department of Transportation says the contractor for the project has been conducting weekly reviews. Additional reflective striping and lane marking was added to the area in December. WSDOT has placed the blame firmly on the speeding truckers that travel through the area, not the roadway design. "It is absolutely safe. Over 200,000 people drive on this section of I-5 every single day and they make it through this section successfully, without issue, without incident,” a WSDOT spokeswoman told KING5. In February, Washington State Patrol conducted a week-long emphasis patrol in the area, targeting aggressive cars and semi trucks. Troopers were looking for violations involving speed, left lane violations, distracted driving, following too close, seatbelts, unsafe lane changes and aggressive driving. Starting the week of April 8, 2019, new signs will be posted in both the northbound and southbound lanes of I-5 in Tacoma and Fife dropping the speed to 50 mph. The speed drop stretches between South 48th Street and continues through two major construction zones to the Port of Tacoma Road. The old speed limit was 60 mph. WSDOT says the new speed limit is enforceable as soon as the signs are posted. WSP troopers will be doing extra speed patrols to make sure people follow the new limit. "The reduced speed limit is the result of a coordinated effort between WSDOT and the Washington State Patrol to reduce the potential for collisions in the work zones," WSDOT said. Is the Current Configuration a Dangerous Design? While state government organizations maintain that the crashes are speed related, truckers feel the design of the road is to blame. "It's a pretty big challenge," one trucker told KOMO. "You've got to be really careful. You have to watch that corner. If you're in the right hand lane if you swerve at all your bumper is right on that." Many trucks are so long that drivers struggle to keep the axles in the same lane. When combined with speed, wet roads and darkness, this stretch can be a nightmare for truckers. In the event of a crash, it’s standard for a driver, the company they work for, or a vehicle parts manufacturer to be held liable for causing the incident. But there are cases where the victim and their attorney turn their attention on the design of the roadway and how it might have led to the crash. Most roadways are designed and maintained by the states or the federal government or local municipalities. A poorly designed ramp or misplaced signage, along with other flawed design features, can lead to severe injuries to unwary motorists. Since a city, state or the federal government is responsible for highway design, an injury claim would be presented against these entities. Defective roadway design cases are typically difficult and take years to complete. It takes an experienced car accident attorney to look at all the factors involved and examine possible roadway flaws, maintenance issues, or lack of signage that contributed to the accident. Even when victims have a solid case for a defective highway design claim, government entities routinely deny them. Regardless of what you believe caused your accident with a semi truck, you are welcome to come and speak with the attorneys at Davis Law Group about your case. You have nothing to lose with our free case evaluation offer. 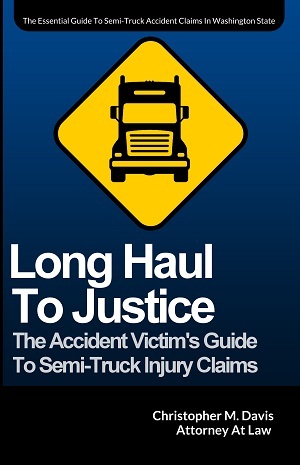 Victims of truck accidents that hire an attorney receive on average 3.5 times more in settlement money than those without legal representation. The aggressive tactics by the trucking company and their insurance carrier can be overwhelming. Have a truck accident lawyer on your side to even the playing field. You or a loved one may be entitled to financial compensation if you were involved in an accident caused by a poor highway design. For a free case evaluation to discuss your case, your injuries and your legal rights, contact attorney Chris Davis and the team at Davis Law Group today. Call us today at (206) 727-4000. You can also use the chat feature below or fill out the form located on the contact page.